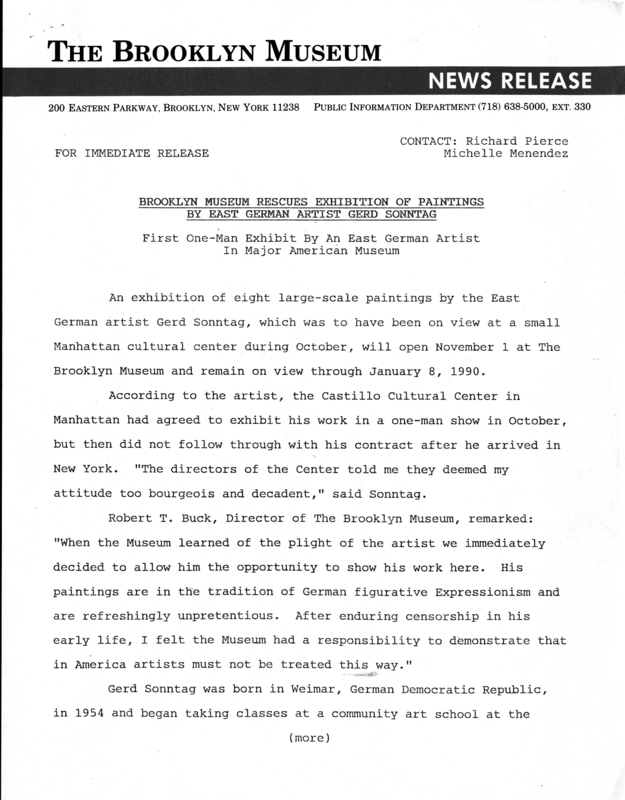 October 1, 1989 An exhibition of eight large-scale paintings by the East German artist Gerd Sonntag, which was to have been on view at a small Manhattan cultural center during October, will open November 1 at The Brooklyn Museum and remain on view through January 8, 1990. According to the artist, the Castillo Cultural Center in Manhattan had agreed to exhibit his work in a one-man show in October, but then did not follow through with his contract after he arrived in New York. “The directors of the Center told me they deemed my attitude too bourgeois and decadent,” said Sonntag. Gerd Sonntag was born in Weimar, German Democratic Republic, in 1954 and began taking classes at a community art school at the age of six, where he studied for 10 years. In 1979 he received a stipend to study at the Academy of Arts in East Berlin, where he graduated in 1982. He was accepted as a member of the Union of the Visual Artists of the German Democratic Republic in 1988. Sonntag has persisted through all the hardships of an artist who lives under a totalitarian system of government but continues to express himself freely. It was not until recently that he was allowed to exhibit his work in his own country, or to sell his work to support himself. The works are executed in an array of strong colors that have been applied with bold powerful strokes. In his series of Women, Men or Children the artist deals with the human condition while exploring the plight of the individual. The exhibition was organized by Charlotta Kotik, Curator of Contemporary Art at the Museum. Brooklyn Museum Archives. Records of the Department of Public Information. Press releases, 1989 - 1994. 1989, 159-160.